I have a great memory of my dad. It was probably the late 1970s and we were waiting in our car for Mom to finish shopping. The radio was on low when the song below came on. It was just the kind of over-the-top song that brought out Dad’s inner showman. He belted it out, smiling at me, singing for me. He sang it better than the artist! I miss Dad’s voice. It was big, deep, rich. He had excellent control, being able to make it very loud or quite low and tender. Until his last months. But I’m choosing not to feel guilty that I don’t miss Dad very much otherwise. As I’ve shared before, Dad and I never figured out how to have an adult-to-adult relationship. He needed to be the teacher, the coach, the mentor, well past the point where our relationship needed primarily to be about that. But more than that, Dad was challenging in his last years. He was often in a difficult mood, often blunt and unkind. I lived in tension, trying to be a good son who honored his father while constantly setting boundaries with him and repeatedly asserting my independence. It is a relief to be free of it. But there was something about his voice. 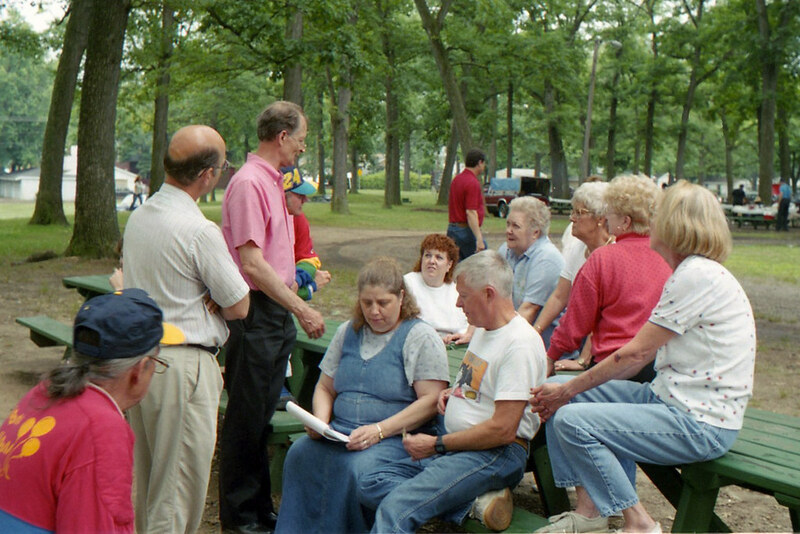 Dad, in the pink shirt and in his 60th year, speaking at a 2001 Grey family reunion. I see Doyle and Susie and Ken and Sharon and Tommy and Gail and a couple other people I can’t make out, all Greys whether by blood or by marriage. When I was three, he picked me up after surgery in the hospital. His low and easy voice erased my fear and filled me with security. When my brother and I were small, growing up on Rabbit Hill, Dad would open the front door and call. “Jim-may! Rick-ay!” Every family for a mile knew it was time for the Grey boys to go home. Dad could carry a tune and sang frequently. Especially in the morning — he loved the new day and often met it with a song. (The rest of us were night owls and didn’t appreciate his morning cheerfulness!) He fancied himself Elvis and went after most songs with all the oomph and verve that implies. When Dad taught, his voice carried the air of authority. He taught young Robyn down the street to play chess. He taught woodworking for several summers to 4-H youth. He taught my sons to sharpen knives. In all ways, his voice carried “I’ve got this and I can show you” in perfect pitch. And when he was angry, Dad’s voice filled with rage and fury. It was deeply frightening to my brother and me when we were small. I did everything I could to avoid hearing that voice, right up until he died. After the cancer was found in his liver and his brain late last summer, his voice sounded strained much of the time. I think this was the hardest thing for me to take as he began to fade away. While I felt bad for him that his failing eyesight and fading strength kept him from so much activity, I accepted these things. But his voice. I always hoped it would come back, just for a minute. Dang you Jim Grey. I had completely forgotten about both Bobby Sherman and that song, but thanks to you they have been embedded in my brain for the last 2 hours. Aaaaaagggghh! The voices of our loved ones are indeed special sounds. And what a full, unabridged range we children got to experience, as opposed to the rest of the world. Yes, that’s true. The rest of the world generally doesn’t hear the tender voice, or even usually the angry voice. Oh Jim…my Dad left us twenty years ago this month, and I still hear him every day. In part this is because I inherited his rhetorical style, which was always passionate, volatile, and often mistaken for mere anger. His last two years were tough for all of us, and tougher for him, but we remember him at his best. I am sure that as my own grief continues its process, I, too, will come to remember my dad at his best. I look forward to it. That’s a fact! Thanks for your encouragement! I nearly lost my Dad two years ago. Your post makes me want to call him tonight when I get home and just chat. I hope you do just that! A beautiful heartfelt post, Jim. Thanks so much for stopping to say so. I miss the sound of my Grandfather saying the Lord’s prayer in Dutch. Can still hear it in my head although he’s been gone 30 years. I used to know it in German! I’m sure it’s very similar to the Dutch version. my father could sing too….